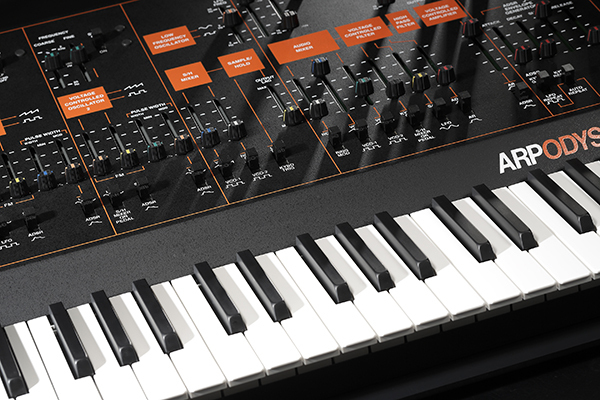 KORG announces new products at Winter NAMM 2015! Forty years later, a complete revival. 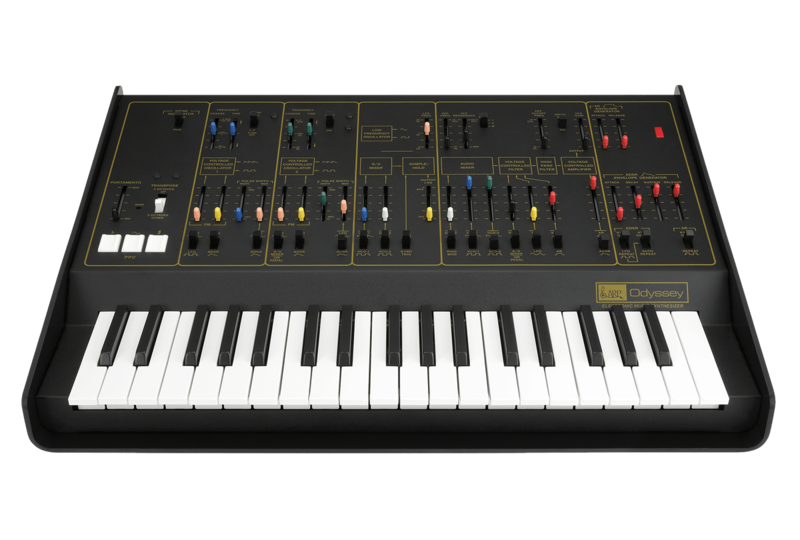 The legendary analog synthesizer that transformed its age. 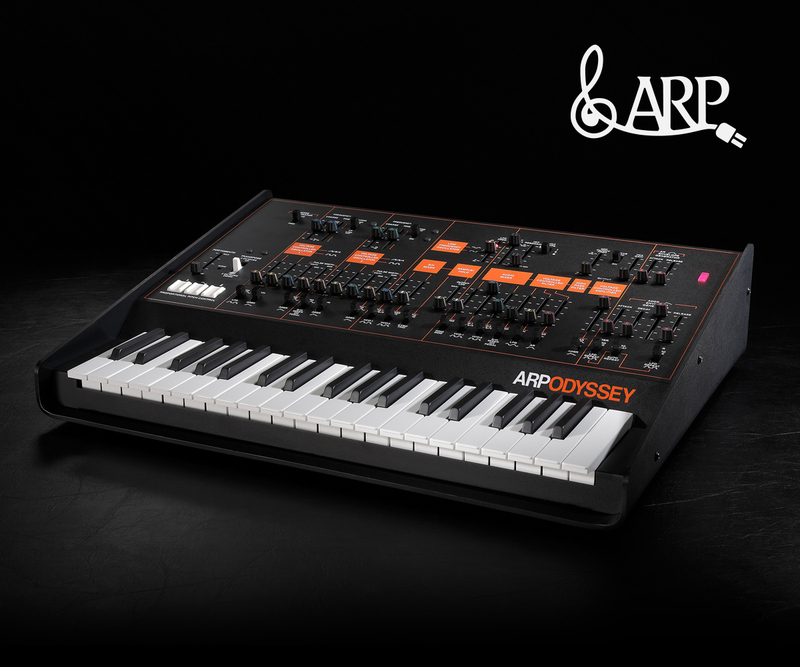 Now in 2015, KORG has brought back the ARP Odyssey for today. With the advisory assistance of David Friend, the co-founder of ARP Instruments, KORG has completely reproduced the original circuitry for artists looking to recreate classic sounds and explore new ones. Together the engineers at KORG and Arp were able to nailthe sound and feel of the original. Every detail has been carefully considered to stay true to the quality of the original, down to the sophisticated semi-hard case. The legendary ARP sound is loved to this day. Long stopped, the wheels of history have again begun to move. 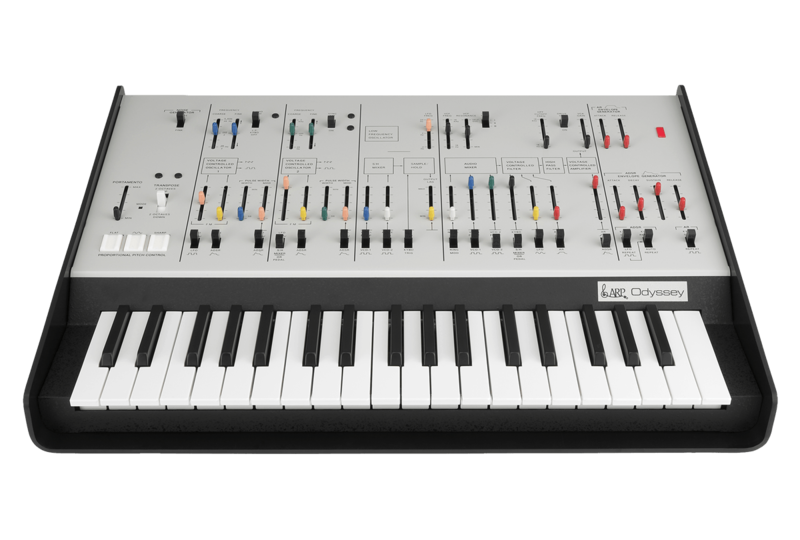 Click here for YouTube videos featuring ARP ODYSSEY. 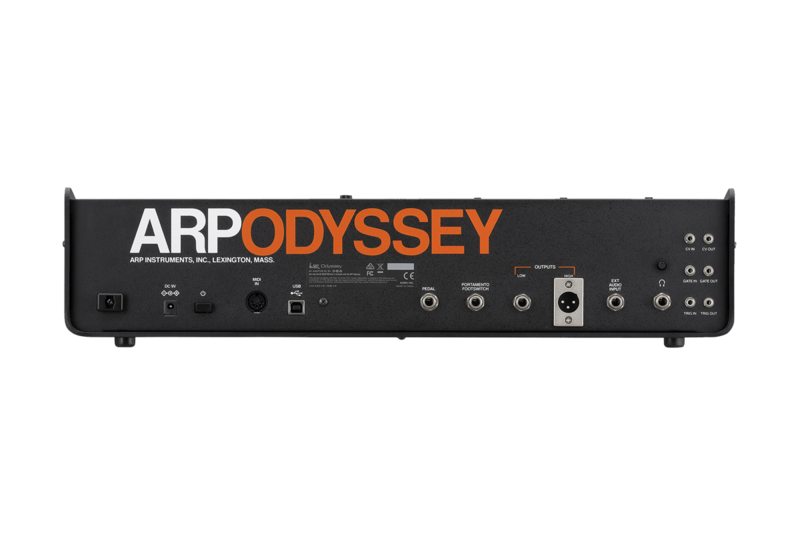 The original ARP Odyssey was a 2VCO duo-phonic instrument. Its most distinctive feature was its sharp, penetrating sound and its rich range of tonal variation. With a variety of functions and modulation possibilities provided by oscillator sync, sample & hold, pulse width modulation, high-pass filter, two types of envelope generator, and pitch bend using the PPC, it was able to create a versatile range of sounds. The ARP Odyssey reproduces the sounds of these components at the circuit level. Under the supervision of David Friend, parts were carefully selected and every detail was adjusted to replicate the original unit's distinctive synthesis. Co-founder of ARP Instruments, Inc. together with the founder Alan Robert Pearlman. 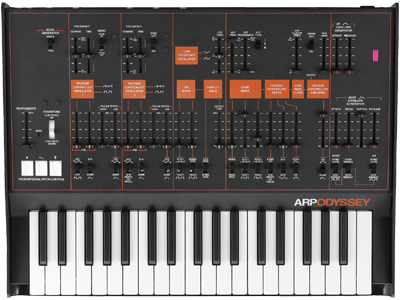 In addition to designing the ARP Odyssey, he was involved with the development of numerous products, and subsequently entered management, eventually becoming president of the company. His achievements as an entrepreneur have also been acclaimed, and in 2010 he received the "Entrepreneur of the Year" (Emerging Technology category) award from Ernst & Young. Currently he serves as the President and CEO of Blue Archive, Inc., as well as being a lecturer at MIT's Sloan School of Management. 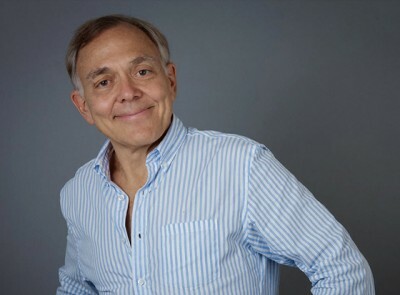 He is also an emeritus of the New England Conservatory and Berklee College of Music. 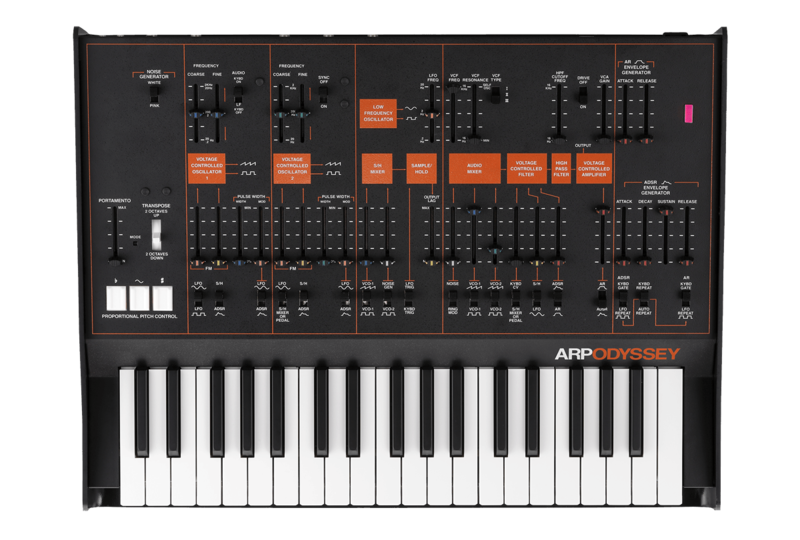 Broadly speaking, there were three versions of the original ARP Odyssey, divided by the date of production, with the major difference being the filter circuit. 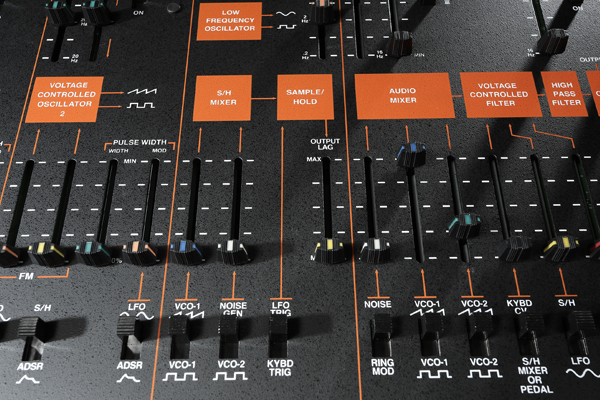 The ARP Odyssey provides all three of these different filter circuits, and allows you to select one of them with a single switch. TYPE I (Rev1) is a 12 dB/Oct circuit that produces a sharp, punchy sound. TYPE II (Rev2) is a 24 dB/Oct filter with great-sounding lows. TYPE III (Rev3) maintains excellent stability even when resonance is raised. These distinctive filters have been reproduced just as they originally were. 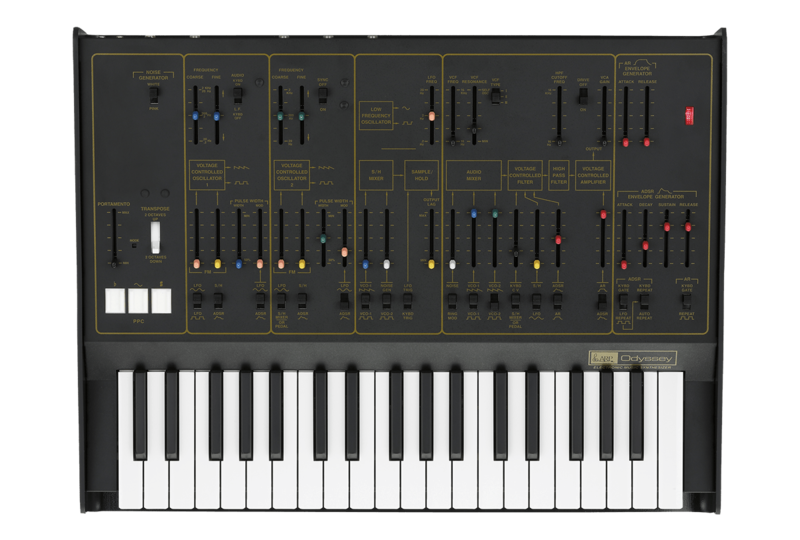 On the original ARP Odyssey, the behavior of portamento when using the transpose function differed between Rev1 and Rev2/3. 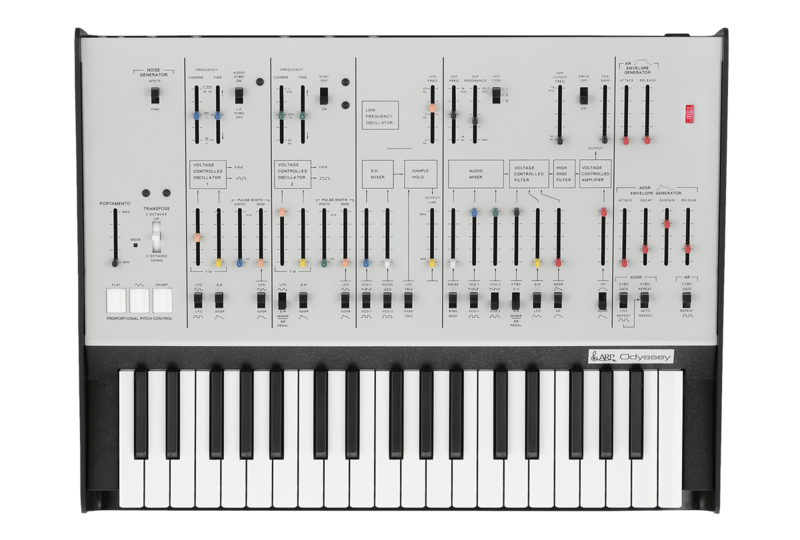 The ARP Odyssey reproduces both of these behaviors and lets you select the desired one with a switch. The ARP Odyssey has been downsized to 86% of the original ARP Odyssey. Carefully selected parts are used in the familiar slider section, providing an operating feel that's even smoother than the original. The keyboard uses a 37-note slim keyboard that features lighter weight and excellent playability. 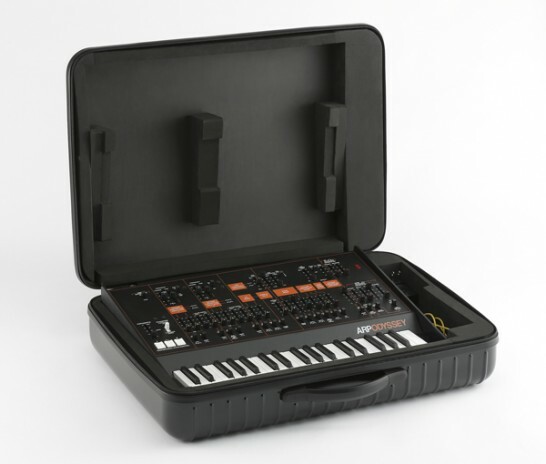 While making the instrument more compact and easier to use, we have also paid attention to ensuring that the mini-keyboard is uncompromisingly "playable." Although the keyboard has 37 keys, the transpose function lets it cover a broad range of seven octaves. 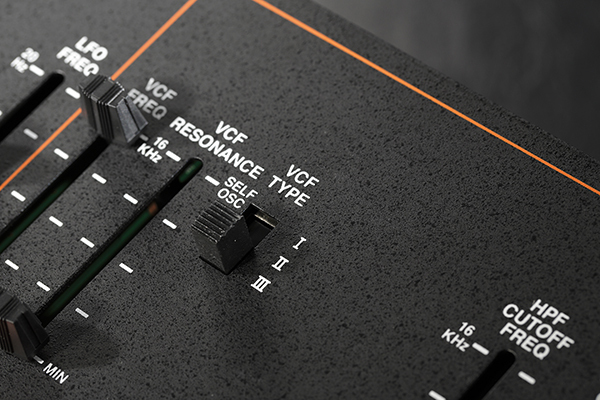 In order to deliver a more powerful analog sound, a DRIVE switch is provided as a new function. 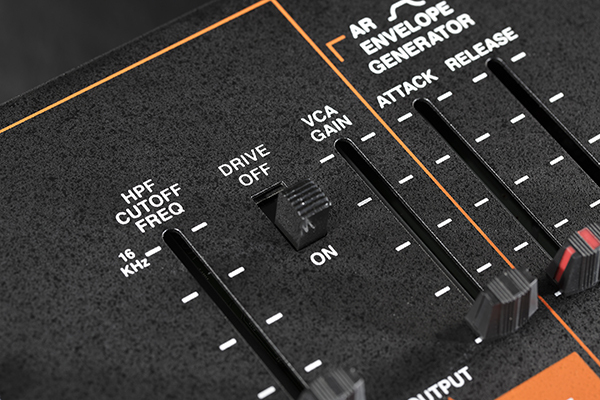 Turning this switch on makes the VCA distort, generating a rough and raw sound. 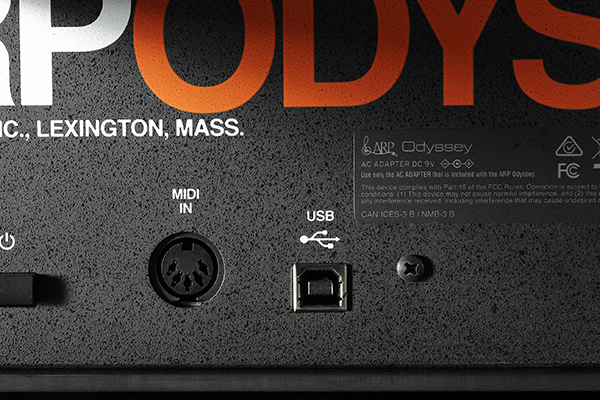 The connectors provided on the original ARP Odyssey differed by production date, but based on Rev3 of the original, the ARP Odyssey brings the specifications up to a modern standard. In addition to a MIDI IN connector and USB-MIDI port, we've added a headphone jack with adjustable volume (*). The XLR output jacks which had been unbalanced have been changed to noise-resistant balanced outputs. Quarter-inch and mini-size patch cables are included. If you connect a patch cable from the newly added headphone jack to the external audio input jack, you can produce a powerful sound by applying self-feedback. If you connect the GATE OUT jack to the TRIG IN jack, the EG won't be retriggered, allowing you to play legato. 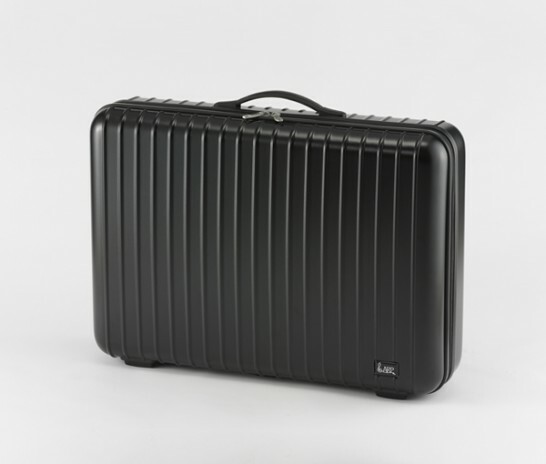 A dedicated semi-hard case that's ideal for storage and transportation is included. It sports the classical ARP logo, and has a sophisticated finish in a black tone. The corrugated shell structure ensures excellent impact resistance, and internal cushioning and pocket for small items is also provided. 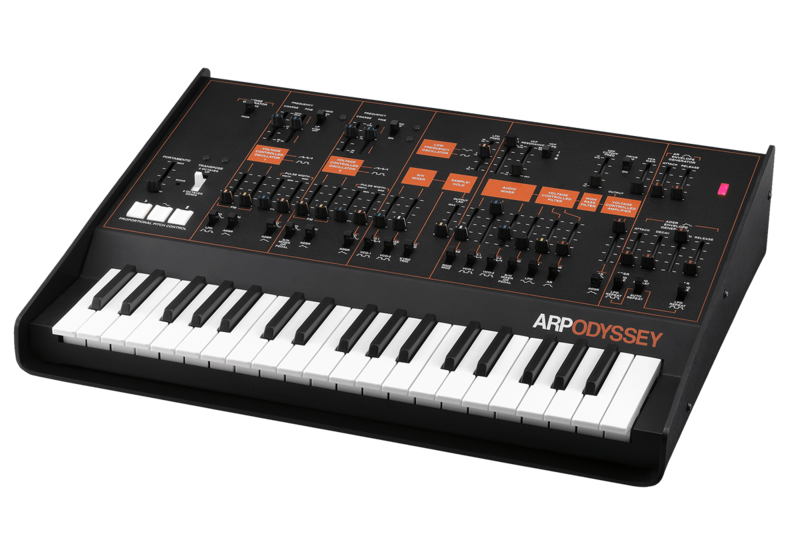 Of the various designs that differed by production date, the ARP Odyssey uses the Rev3 design with a black panel silk-screened in orange. The white-paneled Rev1 and the black panel with gold-printed Rev2 designs have also been revived as limited-edition models. If you're an original user, you can choose the design that brings back those fond memories; if you're a new user, choose the model that you like best.